Make your horse look like a million dollar show horse, with these grooming tips. The popular saying, “you never get a second chance to make a good first impression,” is very true when it comes to showing your horse. Whether you are showing in halter or under saddle, your entrance into the arena is the moment that the judge gives you his undivided attention to make his initial assessment. When you come into the ring, the first thing the judge will notice is your horse’s overall appearance and presentation. This is your best chance to wow the judge. Many exhibitors devote a significant amount of time to training, practicing and perfecting their horse’s performance, only to short-change themselves with a poorly turned-out horse. The presentation of the horse is every bit as important as the performance. Petty describes an appropriately groomed horse as one that is clean, clipped and thoroughly groomed. “You would be surprised at how many horses still come into the show ring with shavings in their tails or manure stains on their coats,” says Petty. Getting a horse ready for the show ring is not something that can be done in a few minutes, right before the gate opens. Grooming for the show ring should begin long before show day. It is as much a part of a horse’s everyday routine as is feeding. A regular grooming regiment isn’t just for show horses. It’s for every horse. Invest in quality horse grooming brushes and keep them clean. You can’t do a thorough job grooming your horse with dirty or dusty brushes. Plus, keeping them clean will help them last longer. To avoid fungal infections, don’t use your brushes on other horses. Curry your horse every day. The more you curry, the more you bring the oils in the skin to the surface. When it comes to currying, there is no substitute for good old-fashioned elbow grease. Select curries according to the season. Winter curries are actually shedding blades that aid in removing hair as your horse sheds. Summer curries are round rubber brushes that come in a variety of sizes and styles. Choose a small, soft curry brush for the face and a larger one for the body. Brush the hair in the direction the hair grows. Don’t neglect your horse’s hooves. They should be picked out daily, not just when you are getting ready to ride. Treat your horse’s feet to a lanolin-based hoof conditioner at least once a week to keep his hooves conditioned. 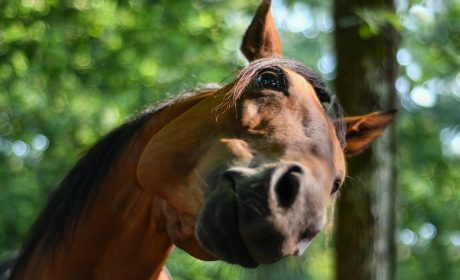 Know where your horse’s ticklish spots are and be extra gentle around those areas. When brushing the mane and tail, start at the ends and work your way up. If you want your horse’s mane and tail to grow out, don’t comb it every day. Instead, just pick out any tangles, shavings or twigs. Grooming mitts are great for wiping dust off your horse and for applying fly spray. If your horse’s mane or tail gets a stubborn knot in it, don’t cut or pull the knot out. Use Cowboy Magic® Detangler & Shine to soften the knot, and then carefully detangle the hairs with your fingers. To stimulate growth, brush the dock of your horse’s tail daily with a dandy brush. This will loosen and remove the dirt and dander that makes your horse itchy. Brushing the dock and upper part of the tail bone also increases blood flow, which stimulates growth. When bathing your horse, use soft sponges, as they hold more water. Use the best horse shampoo. Bathe your horse thoroughly with Cowboy Magic® Rosewater Shampoo, working on one section at a time, from the front of the horse to the back, and from the top of the horse to the bottom. When hosing your horse, direct the stream of water from the front to the back so that you don’t accidentally squirt him in the face. Place a cooler on a just-bathed horse to reduce the chill. Don’t forget to wash underneath his tail and between his back legs. If it’s too cold to bathe your horse, sponge off his neck, face, saddle and girth area with warm water to remove any sweat. Clean your gelding’s sheath or your mare’s udder when needed. 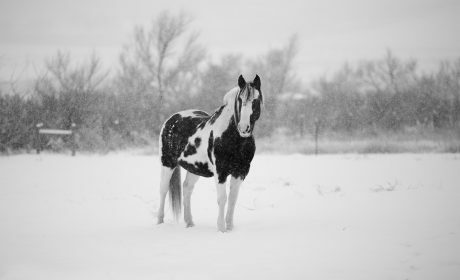 To remove the minerals from your horse’s coat, use Cowboy Magic® Rosewater Conditioner, which is formulated specifically for removing hard water mineral deposits and buildup from your horse’s main, tail and coat. If you are going to body clip your horse for a show, do it a week or two before the show. Body clipping makes the coat dull for awhile, and you want to give it time to get its natural shine back. Bathe your horse before you clip him, as dirt in your horse’s coat will dull your clipper blades and you won’t get a close, even clip. Use clean sharp clipper blades and make sure your clippers are in good working order to ensure the best results. As you clip, check the blades frequently to make sure they aren’t getting hot. If they do heat up, let them cool or spray them with a cooling lubricant. 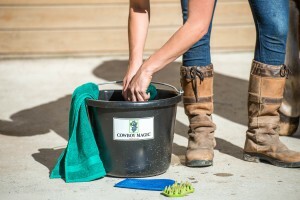 Thoroughly condition your horse’s coat and skin after clipping with Cowboy Magic® Rosewater Conditioner, as clipping takes all of the oils out of the hair. If you use oil and highlighter on your horse’s face for a show, use it sparingly, and make sure it looks natural and blended. You want to avoid the greasy look. Use baby powder, corn starch or French chalk on white socks to brighten them. Keep cling-free dryer sheets on hand. You can run them through your horse’s mane or tail to reduce static electricity. Fill nail holes in your horse’s hooves with a spackling compound that matches his hoof color. To polish his feet, use a wax-based shoe polish. This will protect the hoof from the drying affect of hoof lacquer. If you pull your horse’s mane, use a pulling comb to make the job easier. Pull your horse’s mane after you ride, as the pores will be open, making the hair easier to remove. Use Listerine to desensitize areas to be pulled. Rub a little onto the base of the mane before you begin pulling the hair and when you are finished to ease the itch. Use a bit of baby powder on the inside front of your horse’s blanket to help cut down on rubbing. Wipe the inside of your horse’s ears with a damp cloth to remove any dirt or debris. To get that sparkling shine, spray Cowboy Magic® Super Bodyshine® on your horse’s clean coat. Using your hands, slick the hair with quick, light strokes. Let the hair dry for a few seconds and then use a clean, dry towel or soft brush to polish the hair. For a shiny mane and tail, spray Super Bodyshine® spray onto clean hair, let it dry and then use a soft brush to smooth the hair and bring out the shine. For a quick touch-up and to remove any dust, spray a small amount of Super Bodyshine® onto a clean towel and wipe down your horse. For a quick clean-up of a dirt or manure stain, use Cowboy Magic® Greenspot® Remover. Remember to smile and have a good time! So gather up your horse grooming tools and products and enjoy some bonding time with your horse!